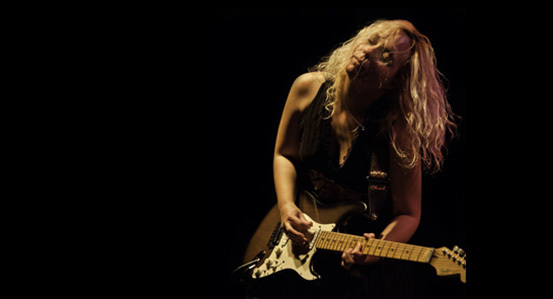 Bradford born award winning guitarist and singer songwriter Chantel McGregor is coming home to West Yorkshire on the 13th February, when she will perform at the Arts Centre in Bingley as part of her latest UK & European tour. McGregor will be performing songs from her new album Lose Control, which was released in October 2015. The tour will see her play 12 venues around the UK between now and the end of June, with one month (April) spent in Europe. Having conducted an interview with the singer this week it looks like a very busy year ahead, as well as performing on tour, Chantel has also started to write new material for a third album. She is looking to showcase her music whilst on tour to introduce her blues rock sound to more new areas of the country as well as overseas, which she hopes will increase her fan base. I have a few favorite albums that I always seem to go back to and hear something different and new every time. Jeff Buckley’s Grace – Jeff Buckley has inspired me ever since I heard “Last Goodbye” on MTV2 when I was about 14. His voice, his tone, his guitar work, his songwriting and his magical performances all captivated me and I’ve never got over it. Every time I listen to “Grace” it takes me back to the first time I heard his music and I fall in love with it all over again. Alanis Morrisette – Jagged Little Pill – Again another album from my teenage years. I love this album for the sheer power and emotion Alanis Morrisette puts into it. The songs are so personal and filled with angst and I think the personal honesty is what connects with the audience, which is what makes this album timeless and still a fantastic album. Fleetwood Mac – Rumours – an album from my childhood. I always remember as a child I would ask my parents to play Rumours in the car. I always wanted to be Stevie Nicks and I used to twirl around with curtains made into dresses pretending to be her. Again I think the personal closeness of this album is the reason it has remained a classic album, people can relate to it in so many ways. Livi is great. I’ve worked with Livi since I was 15, I used to go down to Nottingham and London to record with him years ago, then when I did my first album Like No Other, he was the obvious choice of producer to work with as I knew I worked well with him. The new album Lose Control was great fun to record with Livi, although I must admit I now have a bit of a jerk chicken addiction from recording it in Brixton (we lived on rice, peas and jerk chicken most days for lunch!). I think I’d pick someone totally outside the box like Lady Gaga, because as an artist, I find her really interesting, she has a great voice and is a fantastic songwriter as well as an incredible and individual performer. I’d also love to work with the progressive artist Steven Wilson, as he is probably my current favorite artist. I find his songwriting and production really interesting and his shows are fantastic with visual art and concept videos. I also think it’s important not to grade yourself and your songs against anyone elses, as you can get so wrapped up in what other people are doing that you become paranoid that you and your songs are not good enough, whereas it’s much better to just be the best artist you can be and forget what everyone else is doing. The music industry is difficult to break into, have you ever considered going down the talent show route? You have won a number of British Blues Awards, what’s it like to having your music and talent recognized?